Roy Kesey is the recipient of a 2015 PEN/Heim Translation Fund Grant for his translation of The Cousins, by Aurora Venturini. Read an excerpt of the translation here. (Y)ou will have only junk if you don’t find the voice—inevitable, urgent, necessary, without false pride or hectoring. (…) Of all qualities, voice is the most unteachable, and the closest to magic. Each psyche mapped carefully into language feels as distinctive as a fingerprint, and it’s precisely this quality that first attracted me to Aurora Venturini’s novel Las primas (The Cousins). The story of how I came across the book is fairly standard stuff—an international book fair, an editorial director who knows my tastes all too well. 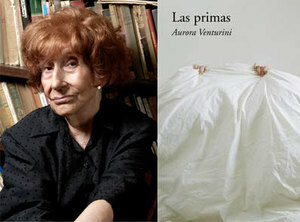 The story of how Aurora Venturini came to be “discovered” in Spanish, on the other hand—at the age of 85, following decades of writing and translating in exile, by winning a contest explicitly designed to find the next hot young thing in Argentine letters—is nothing short of extraordinary. As is the book itself. In the words of Jorge Consiglio, writing for La Nación, “(Venturini’s) prose is omnivorous, using a wide range of registers and tones to modulate the temperatures of her scenes.” She is as at home in Latinate phrasing as in truck-stop vulgarities; her insults and neologisms are ingenious. These resources, combined with a syntax that alternates between galloping rhythms and sudden silences, have enabled her to create a poetics that is entirely unique. The Cousins is in some ways rather dark. There is a murder and a disfigurement; there are miscarriages and untimely family deaths. One of the miracles of the book, then, is how funny it is in many places, and how becalmed throughout. Both of those elements owe everything to Venturini’s signature achievement: the voice of Yuna, the narrator and main character. Rich with dark humor and irony, her observations on family, suburban life, sexuality, and social climbing are candid, at times brutally so. The rhythms, syntactical tics, vocabulary, and internal logic of Yuna’s voice together bear her history, and are the key to her future. They allow us as readers to bear witness to her will not just to survive the world’s perverted ways, but to thrive in spite of them. Signally, however, her voice is heard only by the reader, or nearly so: she has decided that the secret to hiding what she perceives to be her own mental disability is to speak as little as possible to most of the people around her. The language that would “normally” (norms, normality, and normalization being hotly contested terms in the book’s subtexts) flow outward is instead vested in the notebook she fills with writing: the text we are reading. Venturini’s career has exploded since The Cousins first appeared in 2008, with four books subsequently published to widespread critical acclaim. Each of her narrators has a voice that is as inevitable and urgent and necessary as that of any living human being, and I can’t wait for the English-speaking world to discover her as well. This piece is part of PEN’s 2015 PEN/Heim Translation Series, which features excerpts and essays from the recipients of this year’s PEN/Heim Translation Fund Grants. Publishers and editors who wish to express interest in any of these projects are invited to contact PEN Literary Awards Coordinator Arielle Anema ([email protected]) or Translation Fund Advisory Board Chair Michael F. Moore ([email protected]) for the translators’ contact information.